> it simply has to. Given all of my other extreme opinions, it's somewhat surprising that I'm not 100% against the current currency regime (sovereign issued fiat currency, fractional reserve banking), because the idea of a gold standard seems even more chaotic and volatile. Even if I am not a Keynesian, I do think that a decrease in the quantity of money is contractionary, and fractional reserve banking necessarily implies that deleveraging results in a decrease in the quantity of money...so when people pay down their debts (as they're doing now) then we ("we") need to either accept contraction or increase the money supply. So, if we are to have fiat currency, and if we are to have a central bank, and if we intend to fight contraction, then we MUST take steps that increase the money supply. 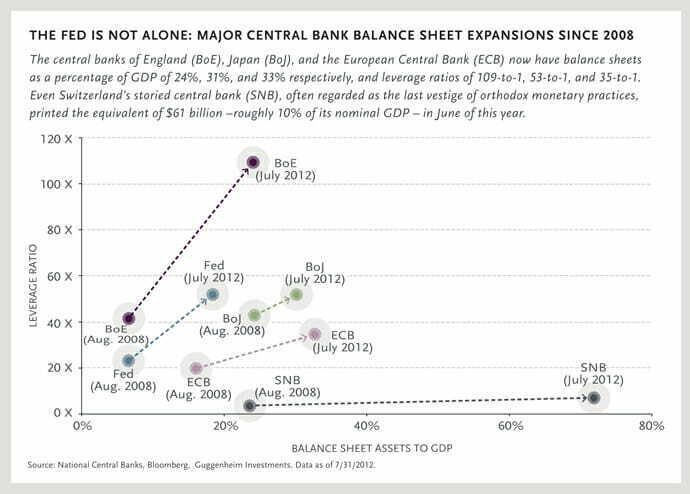 ...and that's what QE 1, 2, and 3 are about. ...so I find all the hand waving that "this is not printing money" to be utterly inane transparent lies. Damn it, you need to print money, you are printing money, just admit it! ...but (and here my understanding grows thing), the point of QE over true running of the printing presses is that the knob that creates the excess dollars in the first place can be twisted back later to soak up the excess cash. And this is a clever implementation detail. 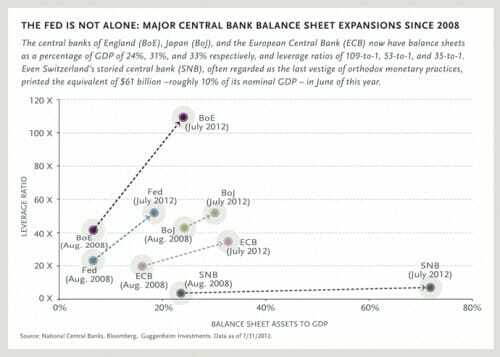 That is the point of QE, the knob can be turned back. But, looking back over 40 years of gov't finances, you think the knob ever will be turned back? The gov't could also reduce the universal service fee on your phone bill, now that 99.8% of US has access to wired/mobile phone service. Or it could spend more money than it has, providing dozens of cell phones to anyone who can show they are getting federal aid. Which will happen, I wonder? Wasn't that just a really complicated way of saying that that the Fed can only reduce the money supply by the value of the securities and bonds it holds? What do liabilities have to do with anything? Which is itself a fancy term for "inflating yourself out of debt", n'cest pas? There is a second problem with increasing the interest rates back to historical norms. That problem is what it will do to Federal finances. If we have a $20 trillion debt, the a 5% interest rate means the Feds would need to pay $1 trillion in interest. So those of us who planned to live off our savings are in deep trouble.